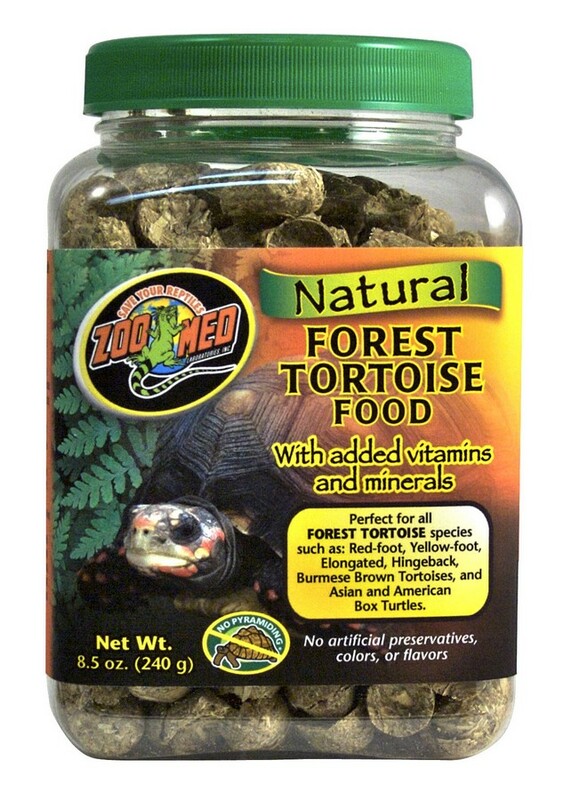 Natural Forest Tortoise Food | Zoo Med Laboratories, Inc.
At last, a natural long-stem fiber diet for Tortoises. 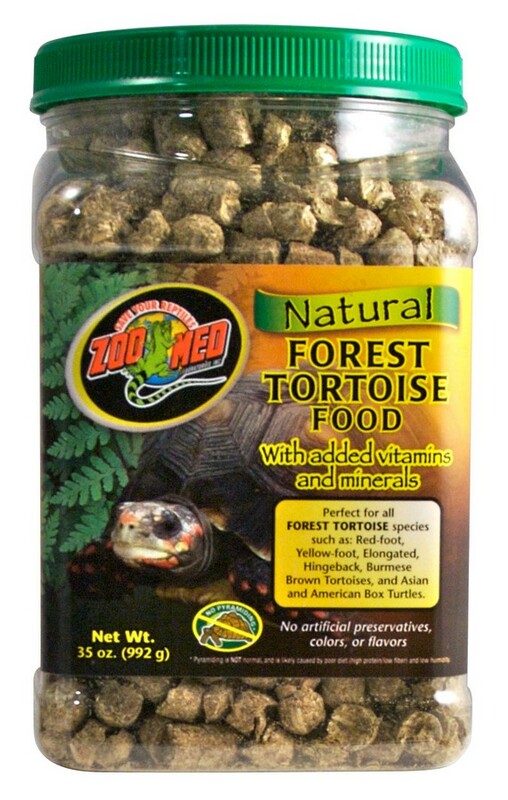 Zoo Med is proud to announce the Natural Grassland Tortoise Food and the Natural Forest Tortoise Food. These new formulas contain long-stem fibers an important part of Tortoises natural diet. Only Zoo Med’s new food contains this necessary fiber which is not found in any other commercial food. This Natural food also contains nutritious Dandelion Greens, Yucca, and other plants that tortoises love! 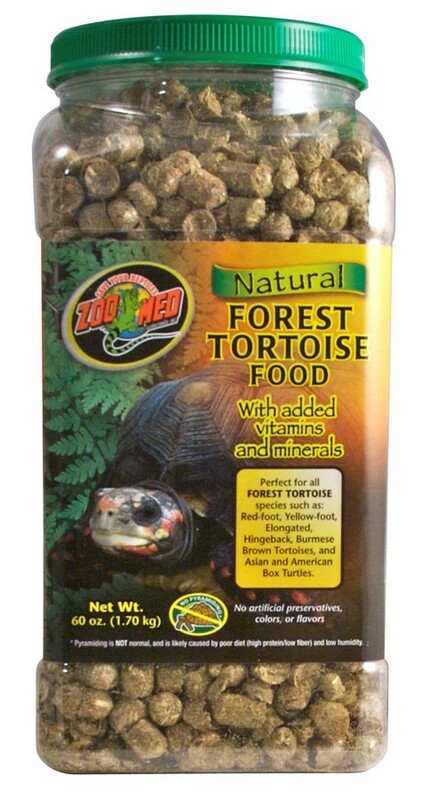 Formulated especially for Red Foot, Yellow Foot, and Elongated Tortoises. 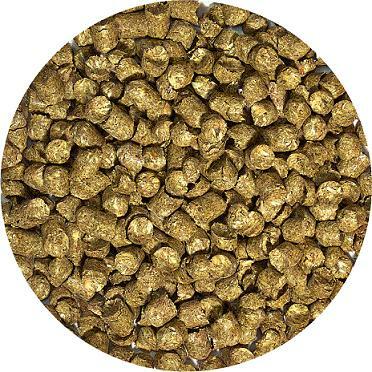 Suncured Timothy Hay, Miscanthus ground grass, Organic Soybean Meal, Almond Hulls, Suncured Alfalfa Meal, Wheat Middlings, Ground Wheat, Dried Mango, Escarole, Endive, Calcium Carbonate, Monocalcium Phosphate, Dicalcium Phosphate, Dried Dandelion Greens, Sodium Bicarbonate, Dried Lactobacillus acidophilus Fermentation Product, Dried Lactobacillus casei Fermentation Product, Dried Bifidobacterium bifidum Fermentation Product, Dried Enterococcus faecium Fermentation Product, Hydrated Sodium Calcium Aluminosilicate, Hydrolyzed Yeast, Brewers Dried Yeast, Yeast Culture, Garlic Extract, Anise Extract, Chinese Cassia Bark Extract, Ginger Extract, Horseradish, Juniper Extract, Yucca schidigera Extract, L-Ascorbyl-2-Polyphosphate (source of stabilized Vitamin C), Vitamin E Supplement, Zinc Methionine Complex, Mixed Tocopherols (a preservative), Rosemary Extract, Ascorbic Acid, Citric Acid (a preservative), Lecithin, Silicon Dioxide, Choline Chloride, Vitamin A Supplement, Vitamin D3 Supplement, Niacin Supplement, d-Calcium Pantothenate (source of Vitamin B5), Menadione Sodium Bisulfite Complex (source of Vitamin K activity), Riboflavin Supplement (source of Vitamin B2), Thiamine Mononitrate (source of Vitamin B1), Pyridoxine Hydrochloride (source of Vitamin B6), Biotin, Folic Acid, Vitamin B12 Supplement, Zinc Oxide, Manganous Oxide, Ferrous Sulfate, Copper Chloride, Calcium Iodate, Sodium Selenite.